Penobscot County dispatchers Kim Moncrieffe (center) and David King (right) together handle a 911 call in this 2010 file photo. The director of the Penobscot County 911 call center resigned late last month. The county will accept applications to fill Chad LaBree’s former position as director of the Penobscot Regional Communication Center until Sept. 14, County Administrator Bill Collins said. The salary will depend on a candidate’s experience but will be “north of” $70,000, he said. LaBree, who became head of the communications center in July 2014 after leaving a similar position with the Maine State Police, accepted a position in emergency communications at a private company, he said. During his last few months as director, he oversaw the absorption of Bangor’s 911 calls — a cost-cutting consolidation process that took months of planning and culminated in May. “Penobscot Regional Communications Center is one of the best emergency communication centers in the State of Maine and the citizens, responders and visitors of Penobscot County are very lucky to be protected by such a professional high skilled group of people that are there,” he wrote in an email. Deputy Director Chris LaVoie has been serving as acting director since LaBree’s resignation in late July, LaVoie said. The communications center fields landline 911 calls and most cell phone calls for Penobscot County, and handles calls gathering information from 911 callers in Aroostook County. But until last May, communications center’s coverage area didn’t include Bangor, which operates its own dispatch center out of the police station. Answering a 911 call and gathering information from the caller — or “PSAPing” — is a different job than than the act of dispatching a first responder to the scene, LaBree said in a May interview. Dispatchers also communicate information to law enforcement officers over the radio and answer nonemergency calls from the public. The communications center had performed both duties from the majority of the county except for Bangor until May. Before LaBree’s time, Bangor voters shot down a plan to consolidate the their local police station’s dispatch center with the county’s during a fraught 2011 referendum. 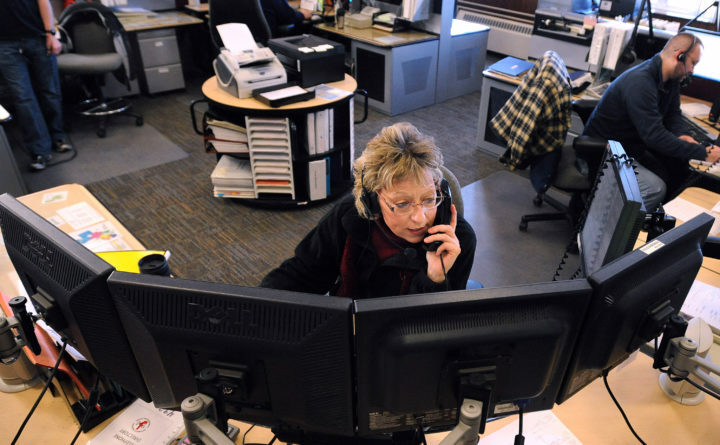 But the transition last spring unfolded without any reported complaints because Bangor police retained their dispatch center, including the familiar dispatchers Bangor voters fought to hang onto in 2011. The police station still performs dispatching duties and answers calls from the public but now relies on the communications center for PSAPing, LaBree explained. As the county looks to replace LaBree, Collins said the county also plans to hire more call center employees — a job that LaBree described in a May interview as a high-intensity, “ever-evolving” job whose importance is often overlooked in the chain of emergency first response.